We left Charoen Phon early that morning, heading up road #1084 towards Kamphaeng Phet over Wang Yang, a straight way to the historical city on the banks of the Ping River. The road was quiet with hardly any traffic and we had a good bicycle path. For the fourth consecutive day we rode an hour and then took a small break to eat some snacks and stretch the legs. The road towards Kamphaeng Phet was slightly up-hill, good for a 40 meter rise at the end-point in comparison with the start. I think it must have been near Wang Yang that we suddenly were held up by a dragon dance performance. Loud drums and music accompanied the colorful dragon and its performers. The fierce dragon came in on our right, whirling and doing the wave in a corkscrew fashion. We braked and let the dragon pass and at the same time engulfed in the Chinese festivity. For hundreds of meters, tables with offerings to the dragon in front of the shops were longing the road. Everybody was in a festive mood. At that moment we knew we were going to end this trip without problems. Dragons are linked to good luck, you know. A few kilometers further, from what I can recall, bikers were joining our track coming from a lane of a school in Tha Makuea. We had good pace and we passed many, many of them. There was a water point where people offered us kindly water. We kept going on and even left a foreign biker behind us. Suddenly we saw a large group of people on both sides of our path, some tents, music; the road was blocked, many people shouting. When we arrived near the tents a standing ovation welcomed us, cameras were turning and not to embarrass the crowd, we both raised our arms in the air. People looked startled as we kept on going. Apparently we had hit a bicycling event. Then, Steve felt in love with a motorized dung cart. He saw the thing passing by, shouted at me to follow him, and jumped behind the cart to stayer. I was taken by surprise, saw no hole to speed into as Steve hung in the middle behind the cart and I left it for what it was. Steve disappeared at great speed behind the horizon. He waited me further up, when the cart plunged into the field to release its content, smiling from top to bottom. A bit later the same cart passed us by again. We both slipped behind it and stayered, reaching more than 30 Km/Hr. I felt like a 10-year old, pure childish pleasure; now I understood Steve’s smile. The guy on top of the cart was encouraging us, laughing and at the same time shouting at the cart driver to go faster. Good he did not stop suddenly or two bikers would meet some cow dung. Finally the cart left the road and we switched back to normal. Shortly after, a local bike rider came upon our wheels. We moved at good speed, taking the lead one after the other every 2.5 kilometers. But the "wanker" - as Steve would call him afterwards - never took the head and rode our slipstream for about 15 kilometers until turning off at was likely his home. Just another me, myself and I. 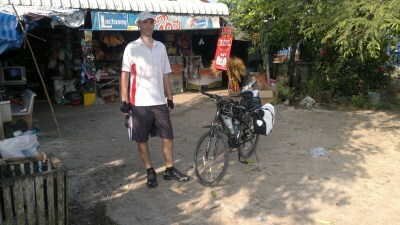 After passing Khonthi and Thep Nakhon we entered Kamphaeng Phet via the south. 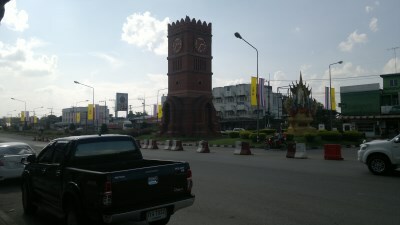 Kamphaeng Phet is geographically located in the lower north on the banks of the Ping River. Its ancient name was Chakangrao and built around 1157 AD by the Khmers as a military outpost. In the period of Sukhothai, King Maha Thammaracha I moved the political and administrative center to Nakhon Chum on the west bank of the Ping River. After his death, Chakangrao became again the center In 1373 Borommaracha I of Ayutthaya attacked Chakangrao. The governor was killed, but the city did not fell. Three years later - in 1376 - Ayutthaya was attempting again to take Chakangrao, but the city remained un-seized. Finally in 1378, King Borommaracha I attacked Chakangrao once more. The king of Sukhothai, Maha Thammaracha II was now present on the battlefield but realizing that further resistance was vain, he surrendered. This event wiped the Kingdom of Sukhothai from the slate. The western part of Sukhothai including Chakangrao was annexed to the Kingdom of Ayutthaya. Chakangrao and Nakhon Chum were united and became known as Kamphaeng Phet, its name indicated for the first time in 1397 on a stone inscription. 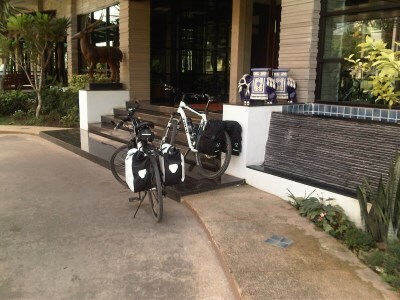 We stopped at the Navarat Heritage Hotel, located on the left bank of the Ping River. It was 1100 Hr and we did an average of 20 Km/Hr. We asked the reception if they could take care of our bikes and they provided a space in their conference room. Compared with the accommodation we had prior, this hotel was luxury; all right not 5-star and already a bit old, but quite comfortable. We soon found ourselves under the hot shower, changed into normal clothes and went for lunch at the hotel's restaurant.